Carley House is always looking for ways to help her family and friends, whether it be caring for them when they're sick or putting a smile on their faces with her sense of humor. So, at Cape Girardeau Central High School's senior prom April 25, Carley's friends repaid that kindness. As Carley stood on stage, wearing a long coral dress, her name was announced as this year's prom queen. The crowd roared with excitement. "It was like time stood still," said Carley's mother, Tamilla House, as she recalled the moment. "When they called her name, it was like my focus was just on her. Like I was right there, up on stage with her, sharing in her excitement." Carley, 18, has Down syndrome. And while she mostly attends a special needs classroom in high school, she also was in classrooms with all students from kindergarten through junior high. "This allowed her to form true friendships and unique bonds with many students in her grade," Tamilla said. "Carley has maintained those friendships throughout the years." A couple weeks before prom, seniors were using social media as a way to encourage others to nominate Carley for prom queen court. "My heart melted just reading those (posts)," Tamilla said. The family didn't immediately tell Carley, because they weren't sure what would happen next. Then, the Sunday before prom, Tamilla received a call from principal Mike Cowan, who wanted to let her know Carley had been nominated. "When I got off the phone, I cried," Tamilla said. "It was so sweet that this group of kids has this bond with her." Tamilla let her daughter know one girl was going to be named the queen, and the others would be princesses. "Either way, it's going to be good," she told Carley. Tamilla said Carley's friends have been by her side throughout the years. They've attended all of her birthday parties, taken her out for ice cream and included her in other social activities. And it was those friends who placed the crown on Carley and hugged her as they celebrated that evening. When Carley's younger sister, Calli House, asked Carley how being named queen felt, Carley said she was excited and getting the crown made her feel special. "It was very exciting to see all of her friends just one last time gather around her and be so sweet to her like they have always been," said Calli, a sophomore at the high school. "She has the biggest heart that you'll ever meet. She cares about everybody, and her personality is always just warm and friendly. It's amazing to see her be rewarded for this." Senior Ryan May said he can't remember how he felt when his name was announced as prom king. "I was just so excited for Carley," he said. Ryan is involved in several extracurricular activities, including his role as student body president and treasurer of the BETA club. Most days, he is at the school until 6 p.m., planning and organizing events. And what makes him most proud of his school, he said, is how it serves as a place for everyone. "There are different types of people included in this school, but they can all come together," he said. "To have something like this happen is amazing. I wouldn't have it any other way." Tamilla said she hadn't met Ryan before that evening, but in the short time of seeing him with Carley, he reminded her of her son, Cody House, who graduated a couple years ago. "It was just like Carley had known him forever," she said. "It couldn't have been arranged any better." As they danced, Carley kissed Ryan on the cheek. Kyle McDonald, president of the school board, fought back tears last week as he described the moment. "I've known Carley her whole life, and that was such an amazing thing for our students to do," he said. "To see her dancing with Ryan was absolutely amazing." When Carley isn't at school, she loves to cook, Tamilla said. She also competes in basketball in the Special Olympics. "And she loves celebrating birthdays, anybody's birthday, but especially her own," Tamilla said. The House family has five members at home. "If one of us at the house isn't feeling good, she'll be mommy to them and cover them up and pat their cheek and feel their forehead for temperature," Tamilla said. "She's just really compassionate to others and aware of people's feelings." Carley always wants people to get along, Tamilla said, and she'll say or do funny things to make others smile. "Her laugh is contagious," she added. Carley can attend the high school until she's 21, but she'll walk with her class in the approaching graduation ceremony. 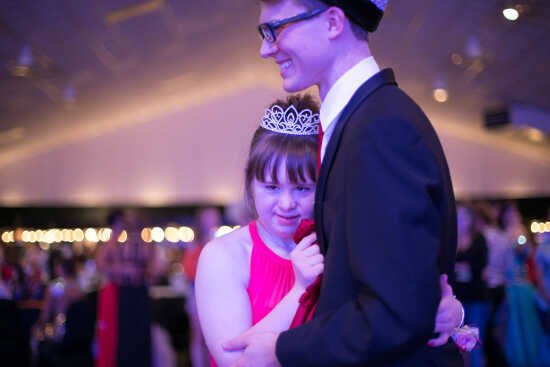 "The main thing for us out of this whole is experience is just that our family is forever indebted to the class of 2015 for their kindness and making prom night the most special night for her," Tamilla said. "It was a blessing and very special to our family. We are thankful God created our family exactly like he did." 1000 S. Silver Springs Road, Cape Girardeau, Mo.